Single-sided Hynix MFR ICs have been making the rounds through various manufacturers recently. I didn’t give G.Skill a pass for them when they came through last time. They just don’t have the performance to go with the MHz due to the timing compromises needed for these kinds of frequencies. ADATA is here to give it a try this time. Let’s hope they reverse the performance sacrifices made for the MHz. Hey, if nothing else, MFR kits are always fun to see how far they can be pushed! ADATA has great packaging as far as blister-packs go. Most of these things are near impossible to get apart. These are perforated so the back can easily be pulled down. 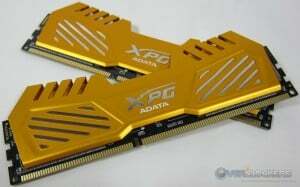 This kit has ADATA’s new XPG V2 series heatspreaders, which come in gold and gray (see the gray version at their web site). I like the new heatspreader design, even in the gold. 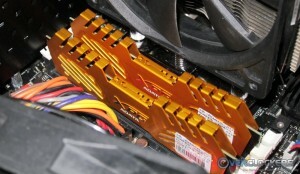 However, do note that like many RAM heatspreaders on the market today, these are a bit tall for some air coolers. With a VenomousX, I had to move these to the outer slots. As mentioned earlier, these are single-sided sticks of RAM and by the speed & timings it’s pretty obvious they are Hynix MFR ICs without needing to take off the heatspreaders. More photos, you ask? Why yes, there are more. Definitely a good looking kit. 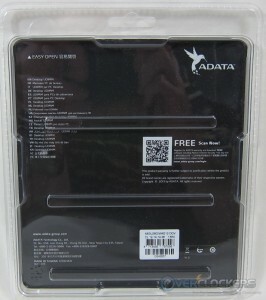 Honestly, when ADATA approached us about reviewing this kit, I asked for the gray kit. After seeing the gold, it actually grew on me and I rather like the look. 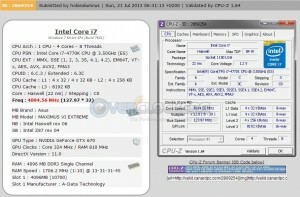 This kit is going to be tested on our Haswell-based system with its killer memory controller. Memory clocking comes courtesy the strong ASUS Maximus VI Extreme. After installing any memory kit, the first thing we do is make sure the sticks work as advertised. I put the CPU at stock, set the XMP profile, set VCCSA (System Agent Voltage) at 1.25 V and booted into our tester kindly provided by UltraX, the UltraX R.S.T. Pro USB tester. It performs the same intense testing. As you can see, five passes passed over four hours of hammering on the RAM. The sticks were nice and toasty when finished, even with a fan blowing over them. R.S.T. Pro passed! Of course, in-OS testing is also necessary. Multi-threaded, HyperPi 32M is the most intensive in-OS test you can get and the ADATA kit passed it easily as well. So far, so good – totally stable through all our testing. 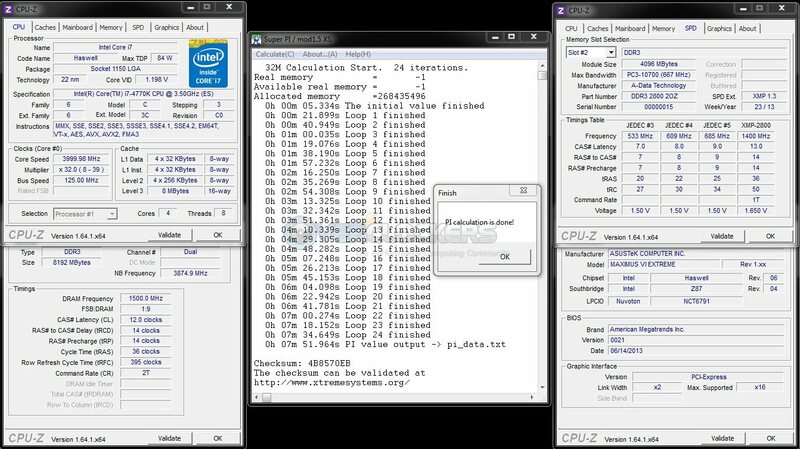 All benchmarks here on all three kits tested were run three times with the results averaged. All results are graphed relative to this kit’s performance. The ADATA DDR3-2800 kit is always 100% and the other tested configurations go over or under that, depending on whether they perform better or worse, respectively. Note that the timed benchmarks are graphed like this as well, and a lower time means a higher percentage, because it’s performing X seconds better than the competition. After reviewing the G.Skill kit, kits with this particular combination of single-sided, Hynix MFR & high timings sort-of became an elephant in the room. Indeed, there has been an ongoing conversation at HWBot about the issue. It even led to Massman posting about it on HWBot’s homepage. Turns out I’m not the only person that thinks it’s silly to have these high-MHz, single-sided kits with loose timings that cost a whole lot of money be out-performed by much cheaper kits. First, the good news: ADATA did a good job with their sub-timings for this kit. 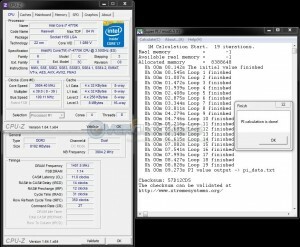 In a couple metrics, it actually performed better than the G.Skill DDR3-2933 kit. 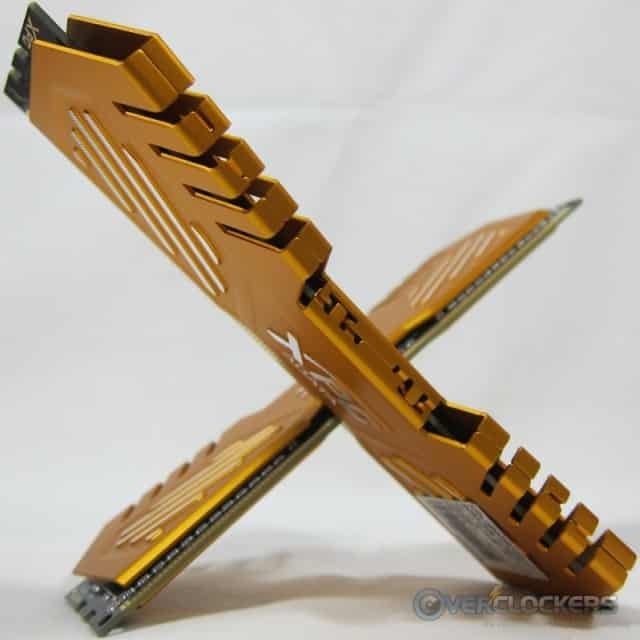 The bad news is that this kit, like the other single-sided, Hynix MFR kit before it, was out-performed by the G.Skill DDR3-2600 / 10-12-12-31 kit, sometimes by a significant margin. People who would buy this kit – benchmarkers – will continue to be less than enthralled by the SuperPi 32M performance. 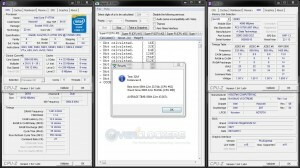 The most notable improvement for ADATA over the G.Skill kit is in AIDA 64’s write and copy tests. In most everything else, the ADATA fits where it should and performs just a little worse than the higher clocked G.Skill kit. In real-world benchmarks, as usual any difference between RAM kits is very small. Throughout, the DDR3-2600 kit rules the roost. Most others (except Cinebench R11.5) show the ADATA kit just behind the DDR3-2933 kit, which is right where it should be. Interestingly, in SuperPi 32M, there was an extremely small difference of less than a tenth of a second between this kit and the DDR3-2933 kit. SuperPi 1M actually sees this kit coming out very slightly ahead. WPrime continues to effectively not care about RAM. 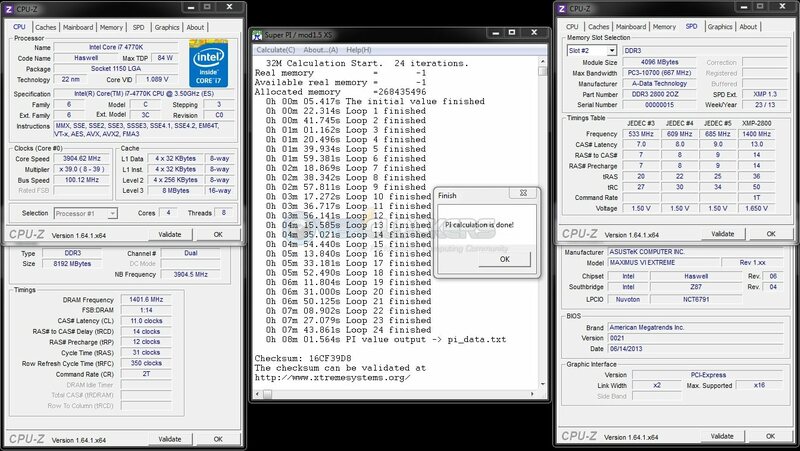 As you can see, performance just isn’t there over the currently-on-the-market (and much cheaper) DDR3-2600 kit. 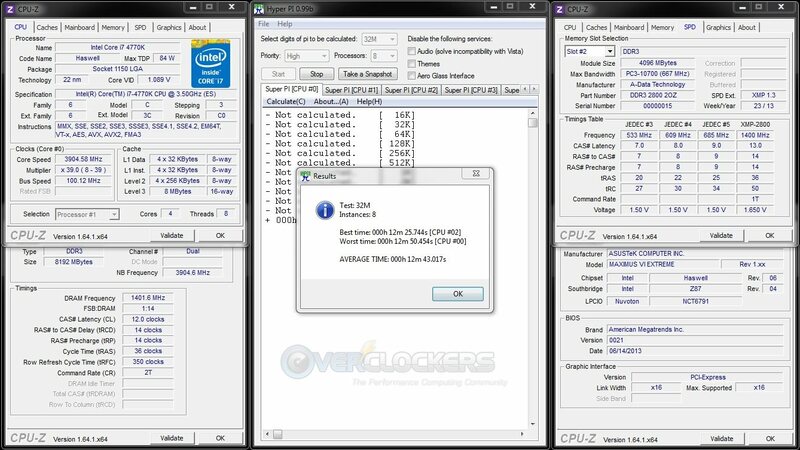 Overclocking is where these kits do well for themselves. While it unfortunately doesn’t really help performance when considering single-sided Hynix MFR versus other RAM (even double-sided, lower clocked Hynix chips), they are a ton of fun to overclock. First off, they did a solid job tightening down at their rated DDR3-2800 and, surprisingly, without raising voltage. At their rated 1.65 V and DDR3-2800, the kit passed SuperPi 1M and 32M with timings of 11-14-12-31. DDR3-3000 was a walk in the park to get to, requiring only 1.70 V to boot right up and pass SuperPi 1M. SuperPi 32M at that frequency was slightly more difficult, requiring a small voltage bump. It passed at rated timings with 1.75 V.
Then I started hammering on the MHz. 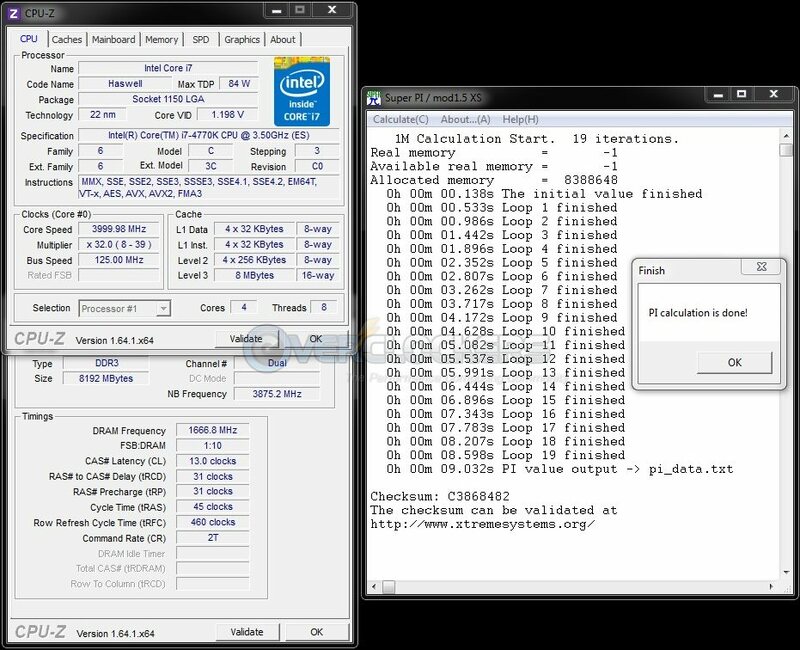 If you’ll recall, the highest frequency I managed on the G.Skill kit was DDR3-3333, and that was just stable enough for a validation. 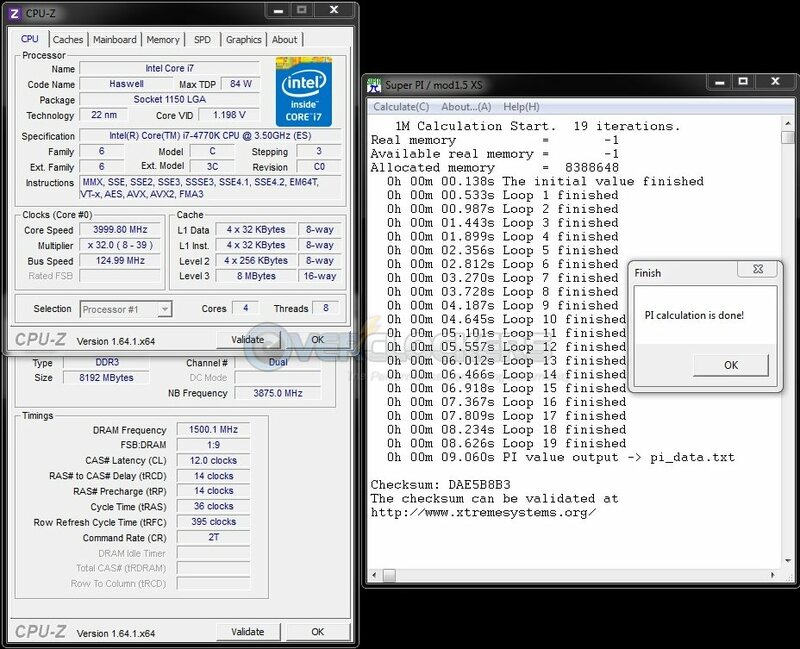 Not so with this ADATA kit – it managed to actually run something (albeit only SuperPi 1M) at DDR3-3333. Unlike the G.Skill kit, it actually booted at this frequency (that one had to be walked up once in-OS) and ADATA’s kit did it with less voltage – ‘only’ 1.80 V instead of 1.85 V.
Last, but most definitely not least – this IS the reason these kits exist after all – is highest frequency. This kit did very well, beating the G.Skill kit at the same voltage by a slight, but noticeable, margin. The ADATA kit managed a validation of DDR3-3412, the highest memory frequency I’ve ever obtained. You can see its validation here. When it comes to overclocking, the ADATA kit is every bit as strong as the G.Skill kit, despite its lower rated frequency. What it will not do, however, is run stable at its rated timings & voltage at DDR3-2933. I tried and it wouldn’t pass SuperPi 32M. This is our second single-sided Hynix MFR memory kit review and I’m sorry to say my opinion hasn’t really changed. As mentioned, this kit wouldn’t quite pass SuperPi 32M at the higher DDR3-2933 frequency. 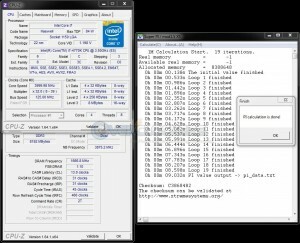 ADATA chose to do some tweaking on secondary and tertiary timings in the XMP profile. It sacrificed a little frequency, but made up a decent part of it in performance, even beating the G.Skill DDR3-2933 kit in two of the four AIDA metrics, though losing to it in SuperPi 32M. The problem with these kits is not their stability at their ultra-high-frequency ratings. It’s not even their overclocking ability, which is stellar. It’s the performance. Once again, we’re faced with a very expensive memory kit that doesn’t perform as well as kits priced less than half of this kit. 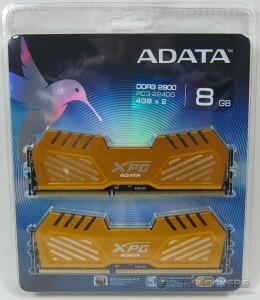 The ADATA XPG V2 DDR3-2800 kits retail for $299.99 (gold heatspreaders) and $299.99 (gray heatspreaders). I have no idea how it could cost five dollars more to change paint colors when considering such a small amount of paint. The kit that beat this one and the G.Skill DDR3-2933 kit – G.Skill’s DDR3-2600 / 10-12-12-31 kit – retails for $139.99. You could buy two of those kits for darn near a hundred bucks less than one of these kits. To be fair to Hynix and their strong MFR chips, it’s not just the chips, but the combination of single-sided sticks and extremely loose timings to run stable at very high MHz. Single-sided modules can only process 64-bits of information at a time, where double-sided can do 128 bits of information at a time (reference). Performance-wise, that is a negligible, but noticeable hit. At these frequencies, those 64 bits are flying through processing, but the narrower bandwidth hurts. Add to that the loosened timings required to make these types of frequencies possible and you get the situation we’re faced with in the high-end memory market today: worse performance in the hunt for higher frequencies. So here we are again – we have a very expensive memory kit that is out-performed by a much cheaper option that doesn’t reach for the stratosphere in raw MHz. Thus, once again, we get a memory kit that isn’t Overclockers Approved. The performance increase for the price just isn’t there. It doesn’t deserve a ‘meh’ though, because it’s right where its competition is and it performs along side the best of them. If you ask me, the entire single-sided Hynix MFR craze that seems to have taken hold of every company producing memory modules gets a ‘meh’, but we can’t hold a single company responsible for the group as a whole. This kit does one thing very, very well – in the hunt for raw MHz, it is up there with everyone else hunting for that memory megahertz public relations dream and ADATA has positioned its kit square in the center of the market. It can clock as well as any other single-sided Hynix MFR kit and managed to get the highest memory frequency to cross my test bench yet. For what it’s made for, if you really enjoy memory overclocking for frequency only and have the extra money to spend on that alone, it’s right there where it should be among its competition. 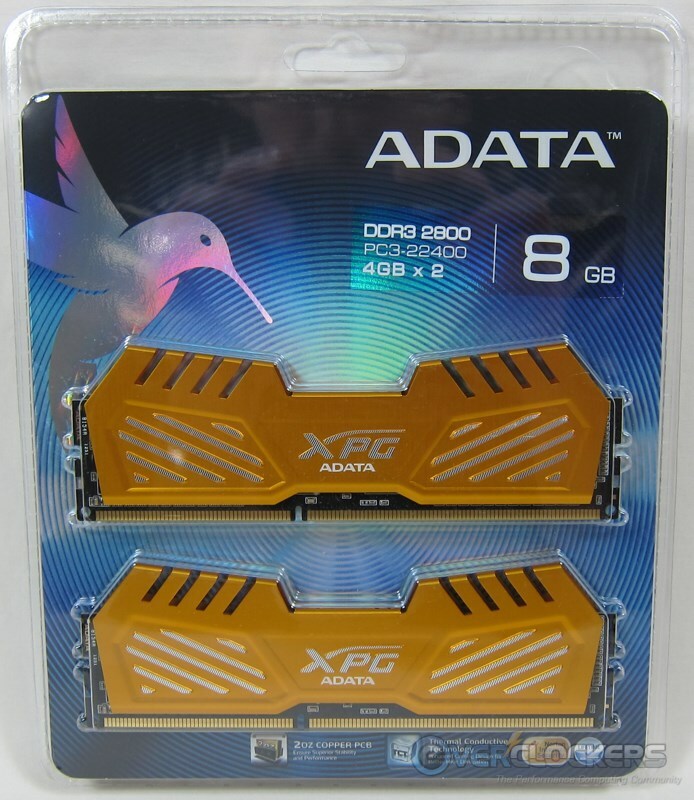 Author’s Note – ADATA has adjusted the price of these kits and the article is edited to reflect that change. They went from their previous $364.99 (gold) & $359.99 (gray) to both kits retailing for $299.99. In their category, that makes this kit from ADATA especially tempting. Still not where they should be in terms of performance, but if you’re looking for a frequency clocking kit, this is a good price for it. The only thing that I dislike in these series is heatspreader design. Depends from PCB it's really close to resistors or is nearly touching them. I don't really like how it looks like too but that's less important thing as you can't see most of the memory when it's installed in PC. 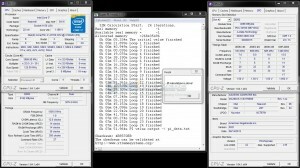 This proves that its not all about MHZ... 2600Mhz RAM blew the doors off 2933. But we should also keep in mind the timings..
so 2600Mhz ram with 10-12-12-31, will win against 12-14-14-35 @ 2933Mhz.. I've asked for some 1600 / 7-8-8-24 kit from G.Skill but haven't heard back yet. That's the one I'm excited to see. The problem is ALL of them are pushing these high MHz kits right now because they think the "WOW" factor of DDR3-3400 on air is something to get excited about. Yes, it makes people say "wow"....but then they go buy something cheaper because it doesn't mean a darn thing to them. No memory manufacturer is getting that right now. They're all on this MHz-at-all-costs kick and, in case you can't tell, I am not a fan of this trend. 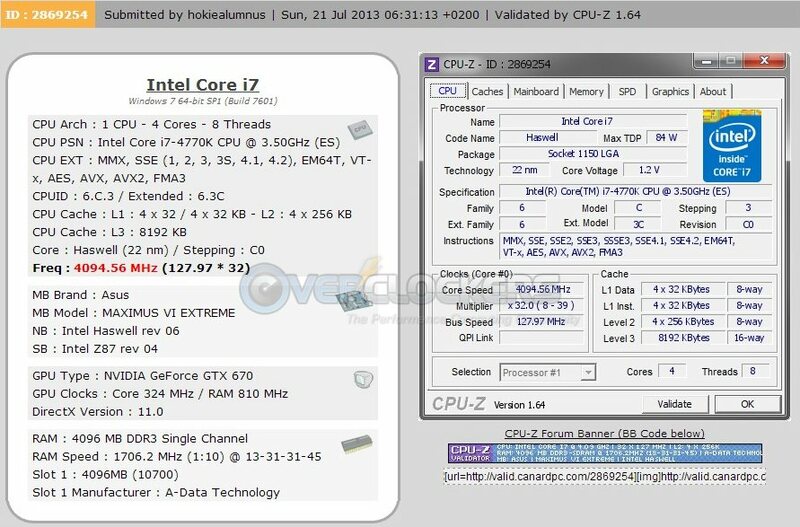 I am a fan of overclocking these kits though, it IS a blast to do if you enjoy memory overclocking. However, to the layperson it's just not worth the money. I have 4x2GB DDR3-1600 7-8-7-24 and 4x2GB DDR3-1600 6-6-6-20 in case you don't get/hear anything from G.Skill. They just aren't high-density sticks. Wow, nice gold, need a solid gold heatsink (and a small one at that) to match. Well, anything over 2400 has always been pretty expensive. I think $300 for 4x4GB DDR3-2666 is about the most I'll pay for a kit. The best real world use for high speed ram, IMO is a gaming APU rig. That said, sticks this expensive probably wouldn't apply. wow, 7-8-8-24.. That's got to be freakin shweet!! Pretty sure they're sending one sometime soon. Can't wait to test it out! And be sure you test it against those POSes...hahaha..
Do you have any Hypers laying around? I'd be interested to see 1600-6-6-6 too. Unfortunately, I never owned any hypers. The best RAM I ever owned were psc kits and both went to the IMOG benching cause. Then he killed one from each kit....but they clocked the same so he still has one good kit. If you compare results on haswell then better look at multithreaded benchmarks. That's one of reasons why new AIDA64 is showing much higher transfers - tests are now based on more than one thread. Still higher memory clock = higher writes and lower latency. In most benchmarks memory read bandwidth is what counts most and this is generally based on balanced high clock and tight timings. 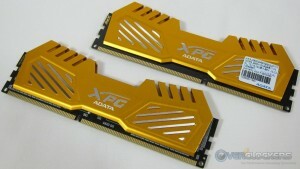 ....and ADATA has just sent out a press release that they've released a DDR3-3100 kit. I think Massman had the best reaction. Too many consumers, even those that don't buy this kind of kit, see the frequencies and oooh & ahhh over them. The reason these things are successful is because people don't know any better. They won't know any better as long as respected sites like TPU (and pretty much everyone other than us AFAIK) show bad performance then proceed to give them awards like highly recommended on a page titled value & conclusion. New double sided CFR are not that bad if you look at performance even though main timings are really relaxed but they're not overclocking good ( at least not these that I was testing ) ... so I guess that we don't have big choice with new IC. Maybe Samsung will show something better.